Yum Butter is a brand of nut butters from right here in Madison, Wisconsin, and they make lots of weird and wonderful flavor combinations. 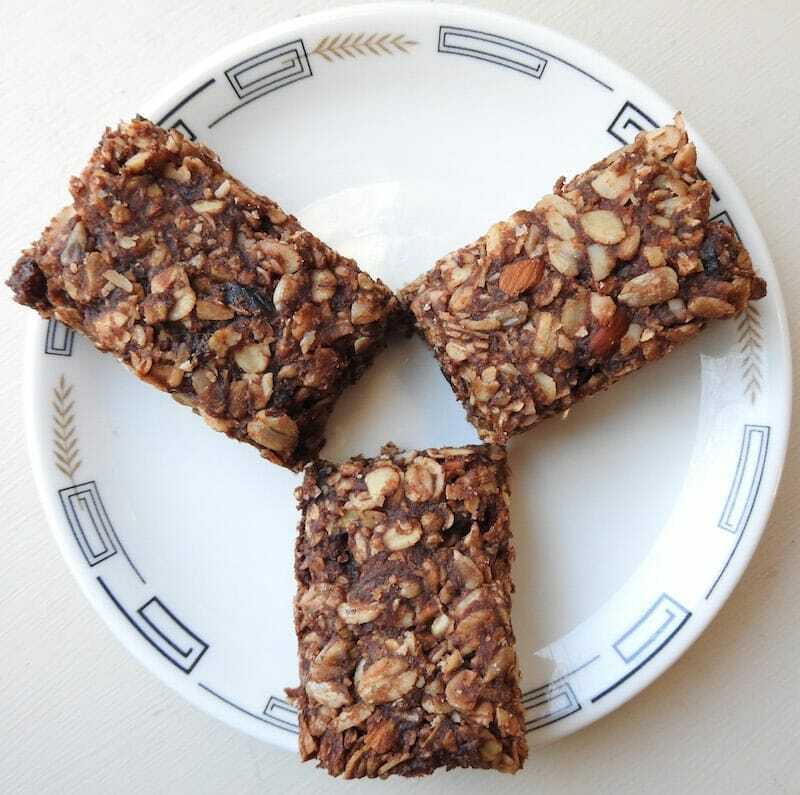 Usually I make my own nut butters in my Vitamix, but one of my friends gave me a fancy espresso-chocolate peanut butter that they make, and I decided to try it in granola bars. Yum! Chocolate, coffee, peanut butter—three of my favorite things, all in one snack! What could be better? If you like this recipe—or if coffee isn’t your style—check out my other granola bar recipes. Mix all dry ingredients (*oats, coconut, sunflower seeds, chopped almonds, chocolate chips* and raisins) together in a bowl. Heat honey, Yumbutter, and butter together on the stove on low heat, or in microwave until butter is melted and mixture warm. (Took two 30 second sessions in my microwave.) Stir until smooth. Then mix in applesauce. Press into the bottom of a greased 9" x 12" baking dish. Let cool completely before removing bars from pan. Recut along the lines you scored before baking, then remove pieces from baking dish. Let cool completely before removing bars from pan. If you try to remove them when warm, they will fall apart.